DoYouShoe aims to make a detachable shoe called 'REVO', which you can not only buy in 'pairs' but also in 'parts' initially targeting teenagers and youths who are school/college students with limited budget for clothes/footwear, travellers and also for the general public. 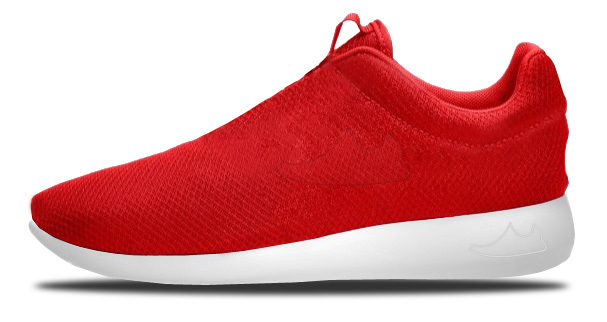 The footwear can be detach and machine washable, can be flatten to conserve storage space and reduces carbon footprint with the ability to separate the canvas material 'uppers' from the rubber outsole for easy recycling. More importantly, the REVO is a shoe and an art canvas combined. As the upper can be detach form the bottom sole, it could then be flatten, transforming it into a canvas where you can create your own design on them and have a completely customised shoe made by YOU! So as you buy the shoe, you also get to bring out your creative side as well. With our product, you will "never buy only a 'pair' of shoe ever again." Have you ever asked yourself the question "where is it that states that shoes could only be bought in pairs?" Is it written in any laws? Was it stated as a mandatory requirement from an international organisation? Or is it the footwear companies that has put this idea that it makes no sense whatsoever to purchase a single side of a shoe or any part of a shoe for that matter. We want to change this. We want to break every rule of the footwear industry that is controlling users, in terms of how a shoe should look, sold, worn and kept in order to convince us that there is no other way other than what they have made us to believe. 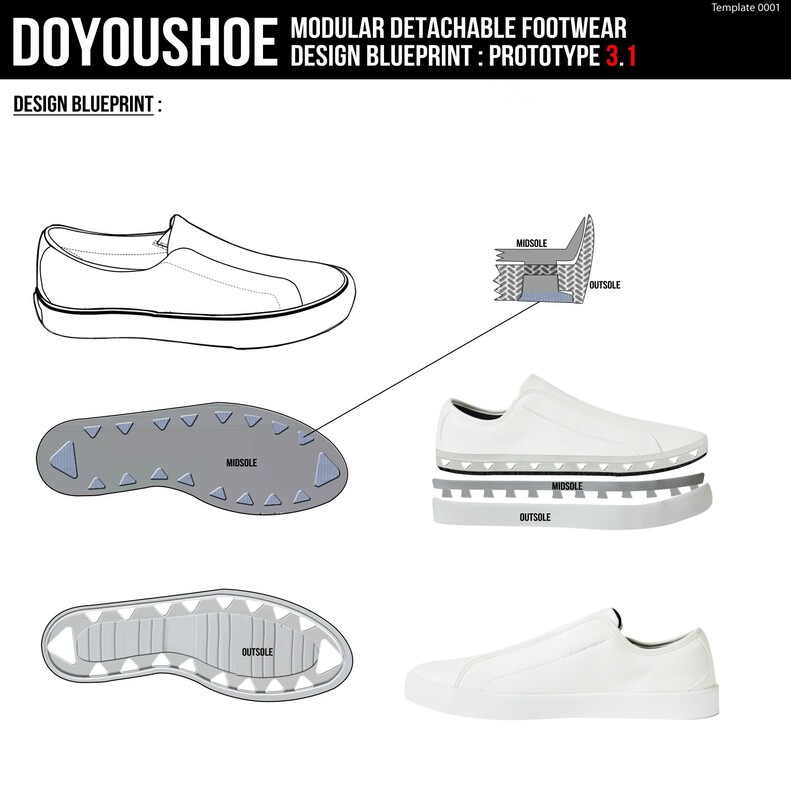 We are starting a footwear company called DoYouShoe to make detachable shoe called 'REVO' which you can not only buy in 'pairs' but also in 'parts' initially targeting school/college students, travellers and also for the general public. What we want to do is simply create a shoe that users can customise which generates curiosity and creativity within them; create a platform for them to showcase or sell it to other people who shares the same interest and wants to buy it, lead them to the centre of the platform; and help them create a new culture in footwear and lead the movement further into the future. We are not directly in the shoe business; We are in the business of influencing creativity, change and improving the social livelihood of school gores of medium to low income family so they don't have to worry about their appearance and concentrate more on the things that really matter; their education. Growing up, most of us had more often than not faced the problem of torn shoes, especially in relation to school shoes. The problem is that most of the time the tear appears on only one side of the shoe while the other side is very much in good condition, but the only option you have is either to change to a new pair, try to mend them on your own or throw them away. We were always bothered by how limited these options were so we decided to do something about it. So we spent a great deal of time to know and learn more on how do we encourage kids to be more creative while solving the common problems related to footwear. - we 'break' the shoe into parts? - we let users be able to 'break' the shoe. We took this idea, made a prototype and tested it out on over a hundred kids. And that's how REVO was born. So to us, the REVO was a shoe we wished we had when we were growing up. The idea for detachable shoes began as a joke, literally. This was back in the days when I was flipping burgers at a fast food outlet with my friends, living in a hostel, mostly broke. Most of the time just lazing around telling stories about how hard our lives were growing up. One day, one of my friends started talking about his village and about a boy who wanted to have a pair of soccer shoes so badly, so he went to his mother. My friend went on to tell us how the boy came running from the field and excitedly told his mother how when he was playing soccer, he saw a kid wearing the most beautiful and awesome soccer shoes he had ever seen. With gusto in his voice, the boy continued to tell his mother how the shoes made that kid run faster, kick further and enabled him to play like a professional soccer player. Everyone on the field admired this kid, and it was all because of the shoes he was wearing. He promised he would never ask for anything else from his mother if he got those incredible shoes. She had to break it gently to him that, although she understood how much he wanted those pair of shoes, she would not be able to buy him a pair because their family is very poor. Even if she saved up money each day, there was no guarantee that she would be able to buy him a pair of those shoes. 1) It would solve many of the most common problems related to footwear. 2) It will finally give more purchasing options for users instead of just the 'pair' option. 3) Environmental-friendly foot attire that is 'recycle ready'. 4) It can inspire creativity in users and promote a 'prosumer' concept. Being inspired by its ability to be unique, we got excited and decided to create REVO shoes; reviving the old traditional culture of footwear through modern design and innovation with a new way of thinking on how a shoe should be designed, made, worn, purchase, maintain and kept. Initially it was a hobby. We were neither a shoe manufacturer nor are we in the footwear business. We did it purely with the intent to make the brilliant idea of a kid to be able to purchase a side of a shoe, and also because it is a fun thing to be doing in the weekends. We invested time, money and energy to move forward until we got to the final REVO shoe prototype made! Looking backwards, we spent thousands of hours of hard work and invested all our last 2-years savings as well as taking out a personal loan for this project. Now we got an incredible momentum going! We quit our corporate work live - all for REVO! We want to dress the world up with this new footwear idea and culture. To do so, we need your help and passion! a) Detachable, interchangeable, lightweight upper. b) Compact - folds flat for easy travel and storage. c) Machine washable, quick dry. d) Environmentally friendly to enable easy separation & recycling of different materials. e) Designed padded 'AllSole'*, providing metatarsal and arch support for stability and comfort with ultra-durable and low-profile rubber sole. g) Comes with 2 colours of Plain White and Black for easy designing by users. Drawstring bag. Fabric marker to start off your designing creativity. h) Full size range for men and women. i) Style range of 3 additional optional custom design - to suit your individualistic style. You want your kid to use REVO shoes because not only will benefit them in solving the most common problems related to footwear, but it will also allow them to be creative as well. More importantly, the REVO is a shoe and a art canvas combined. 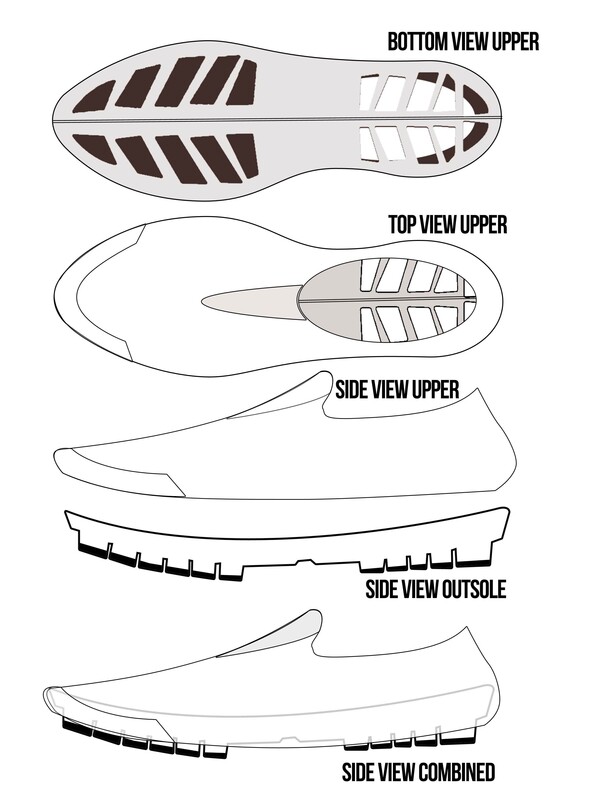 As the upper can be detach form the bottom outsole, it could then be flatten, transforming it into a canvas where you can create your own design on them and have a completely customised shoe made by YOU! So as you buy the shoe, you also get to bring out your creative side as well. Help us build the 'REVO' so that we could help create a better shoe for kids everywhere and give them confidence and the ability to design a better future for themselves. We also need your help in by making a pledge for us to make this idea a reality and making it available to the entire world. To push the human race forward. We would encourage you to connect your Facebook with pitchIN before you pitch to the project. If not, your pitch will be identified as "anonymous" in the Project Page. However, if you choose to pitch anonymously, pitchIN would still have your information. We think it would be just awesome if we can see and identify our supporters in the wall of pitchers. A pitcher/pledger does not need a PayPal account to pitch or pledge. What he/she needs is a credit card (Mastercard/Visa) or a debit card. WATCHTOWER AND FRIENDS SDN BHD is the company that owns and runs pitchIN. However, the person must send pitchIN the proof of transfer by attaching the receipt to the email address: [email protected] with the Subject Heading: DoYouShoe. Upon receiving that, the folks at pitchIN can then quickly update the project page. Thank you again and we do hope you will support the project! *Your name will be up as a virtual Gratitude badge that will be displayed on our Facebook page. *Your name will be up as a VIP Virtual Gratitude badge that will be displayed on our Facebook page.